Winnie & Walter December Rerun! Sharing with you the monthly rerun feature from Winnie & Walter. This month, the stamp set that will be on sale is Winter Wonderland. This is lovely holiday set with gorgeous holiday images and sentiments. 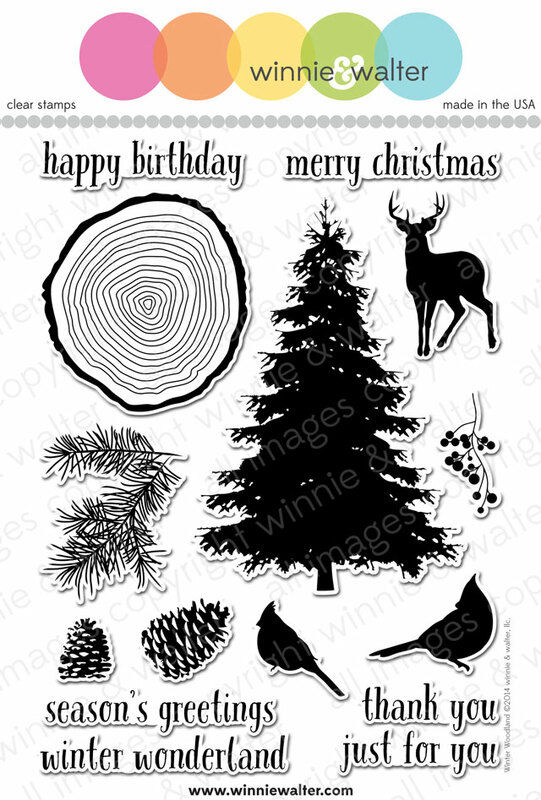 I should say this is one of my favourite holiday stamp set from Winnie & Walter. I love the cross sectional wood, reindeer the pinecone…. Very versatile set.There is so much you can do with the images in this set. I decided to do a vintage looking card. I stamped the pine leaves in three different shades of green around a cream panel cardstock. Started with the lightest shade, then the medium and finally the darkest shade of green. I have used Soft Leaf, Soft Olive and Forever Green Hero Arts Shadow Ink. Then I stamped the pinecones in Espresso pigment inks. I love the subtle dimension the pigment ink gives. Love the layers of stamping. This gives depth to the images as well. 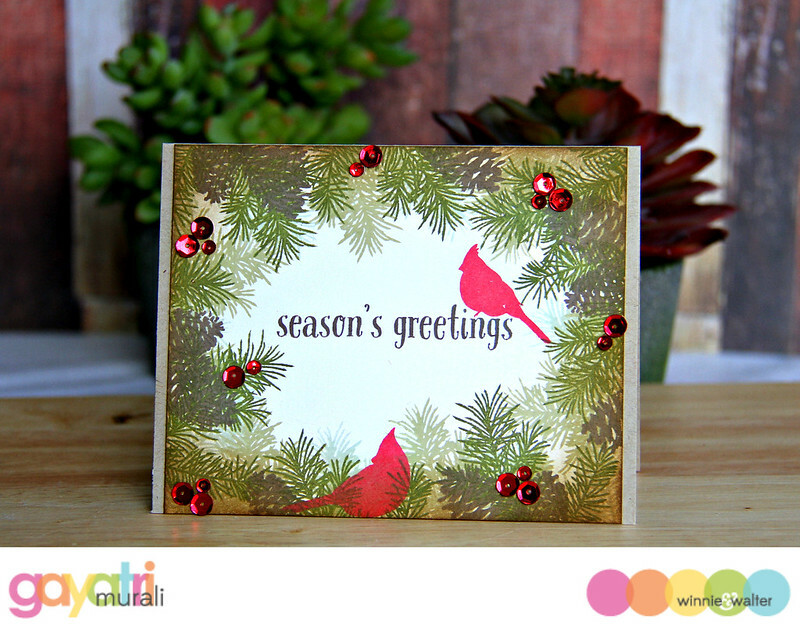 I stamped the sentiment in the middle using the brown ink, the birds with Ruby ink from Hero Arts. I sponged Gathered Twigs distress inks on the edges of the panel. The panel is adhered on kraft card base. I added metallic red 6mm and 4mm sequins from Pretty Pink Posh as berries. That is all! Here is a closeup. Check out Winnie & Walter Blog for more DT inspirations. This set will be on sale through out this month. There is a challenge running with this feature. Here are the rules of the challenge. Create a new project using Winter Woodland (and/or the coordinating cut files). An alternative to using Winter Woodland (and/or the coordinating cut files) is to create a new project using one of the projects featured in this post (or any Rerun post throughout December) as your inspiration. Make sure you use at least one (1) w&w product (this can include a freebie) in your project. If you choose the alternative to using Winter Woodland (and/or the coordinating cut files), please include in your post or project description which project inspired you and how. 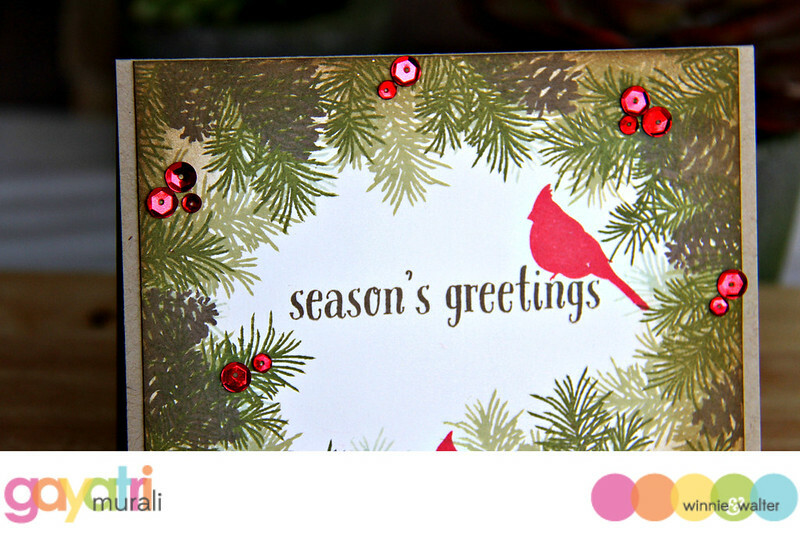 Link up your project here by 11:55 p.m. CST on December 31, 2015. One project will be randomly chosen to win $25.00 credit to the w&w shop! The winner will be announced on the Giveaway Winners page or in it’s very own post on the w&w blog. Now its you turn to play the rerun! fabulous Gayatri. Your card is so pretty. I don't have this set – so will have to be inspired by your card. The card is very beautiful Gayatri. …. The stamping is really nice….. I like the shades you have taken for the leaves….. Very beautiful card! The greenery look so “real”! I have found that the hero arts inks dry splotchy, even Jennifer McGuire's swatches are splotchy on her pinterest page despite the fact that she claims the splotchiness goes away after the ink dries, but no splotchiness on your card! Maybe those are the best colors! Or maybe these inks work really well when you are layering images, like the inks from Paper Trey Inc.? I will certainly give them a second thought. The stamp set is wonderful. I wish I had known about it earlier! Just a great all around very versatile winter/nature scene!